By definition, I am not a locavore, the New Oxford American Dictionary’s 2007 word of the year. Depending on the source, a ‘locavore,’ (noun, pronounced ˈˈlō-kə-ˌvȯr) is someone who exclusively or primarily eats food that is locally grown or produced (typically within a 100 to 250 mile radius). I’d like to wake up in time for a Saturday morning farmer’s market, but I just can’t sacrifice the only day I can sleep in (I love sleeping) for food. Although I prefer shopping at stores with a wider organic or local selection, I rationalize that I’m reducing my carbon footprint by driving to closer chain supermarkets. I do make it a priority to save money so I can spend some extra cash on local fresh produce, but I still crave and buy tomatoes every month of the year. Two of the four items shown are considered local – the honey (made and manufactured in Belton, MO, about 50 miles from Lawrence) and my semi-surviving cilantro plant. Check the Lawrence Farmer’s Market (which is closed in the winter) to see what local produce is in season. 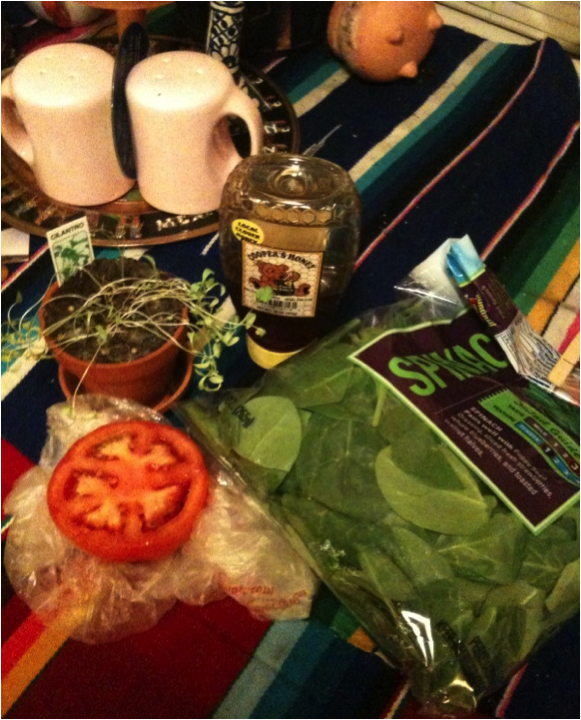 To me, going ’ locavore’ doesn’t have to be an all or nothing thing. Instead, it’s about finding a balance between the things you want, the things you can afford, and the things that are available. With the “Iron Chef” White House garden episode, the popular Academy Award nominated documentary “Food, Inc.”, Michelle Obama promoting garden vegetables on “Sesame Street” and countless other examples of media attention, the ‘locavore’ message is indeed more accessible than ever. For $2.99, there’s even an app for that. Locavore, the iPhone application, shows what produce items are in season near you and what farmer’s markets carry them, apparently making buying local easier than ever. According to the market research firm Packaged Facts, more and more people seem to be finding their own ‘locavore’ balance. Their latest polling found that 54 percent of respondents favored supporting local farmers, a marked increase from 28 percent in 2006. Local food sales rose from for $4 billion in 2002 to $5 billion in 2007, and are predicted to reach $7 billion in 2011. Representatives from Lawrence supermarkets such as Sheila Lowrie, Dillons spokesperson, Mike Smith, Checkers store director, and Brett Hansen, assistant manager of Hy-Vee all said they were carrying more locally grown and manufactured products, and demand for those items was increasing. Megan Dudley, manager of natural food store The Community Mercantile, also reported that business was especially good and getting better. Many feel eating locally is simply a trend that’s popular now, but will soon die down. Locavore was listed in Time Magazine’s 2009 Top 10 iPhone applications , but now, it’s not even in the top 100 most downloaded apps. “Iron Chef” didn’t end up using the produce items they picked from the White House garden, and media outlets from the left and right have deduced eating habits to a subject of political debate. Here in Lawrence, the owners of The Casbah, a locally owned and operated organic market and café, recently announced their doors would soon close. This Google Trend graph suggests that people were eating locally long before locavore was the word of the year or they saw Michelle Obama on TV. 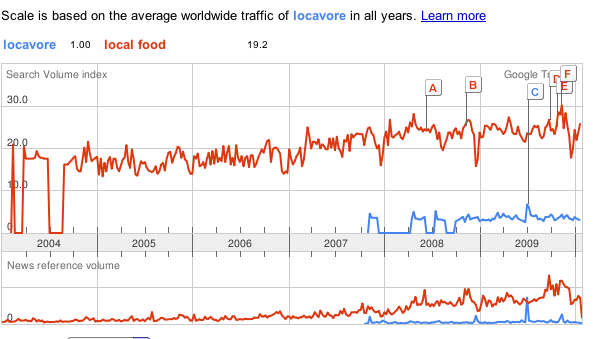 Despite the dips and spikes in the search volume and media tags, public interest in eating locally continues to increase. Even after the spotlight on local eating turns off, people will, at the very least, remember its message. When society is a pendulum that swings both ways, it’s all a matter of finding your own balance. The Lawrence Farmers’ Market is closed during the winter… so that’s probably why nothing is up on the web. I am wondering Dillions and Hyvee, did you ask them about local products? -Kristina B.
I thought it was interesting you mentioned that you were unable to find certain products, presumably because the farmers market was closed. Do you feel that the farmers themselves have a duty to continue to promote their produce and maintain a following of ‘locavores’? Perhaps if individuals had a greater exposure to local products then they would be more likely to purchase them? I apologize for my technical errors….. In terms of exposure, I mean face to face interaction with local farmers. For example farmers could visit schools and educate children about local produce. I think we must focus on this type of physical interaction as opposed to the virtual. I wondered what your thoughts on this are. There are farmers who do what you talked about. There is a restaurant in Kansas City called Blue Bird Bistro that has a Farmers’ Table every month. On that day the farmers who supply the restaurant are there to mingle with the customers. I also know of several farmers who do go to schools… unfortunately farming isn’t seen as a career option for kids anymore (like something to be included in a career day). There definitely needs to be more, though. that was from Kristina B.
Krstinia – thanks for the heads up. Definitely makes a lot more sense know. Amanda – I agree about the education thing. I think the more we interact or play a part in where our food comes from, the greater a concern it will be. As far as being unable to find certain products, it’s not like I’d expect to anyway. Kansas is great for agriculture, but there’s no way (I think) we could grow avocados or oranges like warmer climates. And unfortunately, I love my avocados and citrus.